Do it all - for less! Marantz has been a strong and continued supporter of multichannel high-resolution audio sources like DVD-Audio and SACD, and its new, low-cost DV6001 universal player continues this trend. Replacing the DV6600, it sports a number of video-related enhancements, including DVD scaling up to 1080p, the pinnacle of what can currently be achieved through HDMI links. The new player still uses a Faroudja DCDi deinterlacer. The key change to 1080p has meant considerable internal rejigging, however, including a 12-bit/216kHz Analogue Devices video DAC with a Noise Shaped Video (NSV) filter for PAL/NTSC progressive scan. The audio section remains similar to the previous model, with 24-bit/192kHz conversion available for each of its six output channels. That said, a new DAC is specified, perhaps owing to availability issues as no specific performance advantage is claimed. A new, clearer remote control wand is packaged with the player, which is also home to the Marantz D-Bus system. This allows Marantz components to talk to each other, and for remote commands to be routed as appropriate, even between components that don't include an internal remote control receiver. Extending this element of the design further, an RS232 interface and 'flasher' socket allow the player to be plumbed into a multiroom system controller. The overall performance is very respectable. DVD-Audio is lean, clean and CD-like, although not as euphonic-sounding as the senior digital format. SACDs sound good, too, with a trace of the warmth and grace that is customary with Marantz players, though it tends to sound a little less incisive - subject to the near impossibility of directly comparing SACD and DVD-Audio mastered recordings, even when they are the same performance. But even the most enthusiastic hi-res music collector will still have many CDs. Once again, the typical Marantz euphonic warmth shines through, though one would expect a decent dedicated CD player at the price to deliver more snap and focus, and greater dynamic range - these classic Marantz characteristics are not well represented here. The change to 12-bit video processing and 1080p upscaling gives this unit strong potential in many replay systems. The picture is punchy, with good colour reproduction and considerable subtlety, plus good shadow detail. Only a few screens will show any real-world advantage, however, and they're the ones based on panels or projectors that cost an arm and a leg. But Marantz can hardly be held to blame for this. This wouldn't be our first choice as an audio player, though given its price and overall functionality, its not at all bad as a low-cost, catch-all solution. 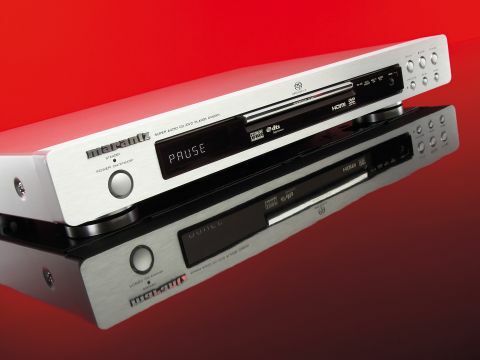 On the video front, however, the DV6001 is up with the best DVD players at the price, with the bonus of decent CD, SACD and DVD-Audio playback to boot.